Good protest songs - the ones that endure - never preach to the choir. They don't rally the converted. They never tell you what to do, just that something should be done. Good protest songs force you to think, to consider. 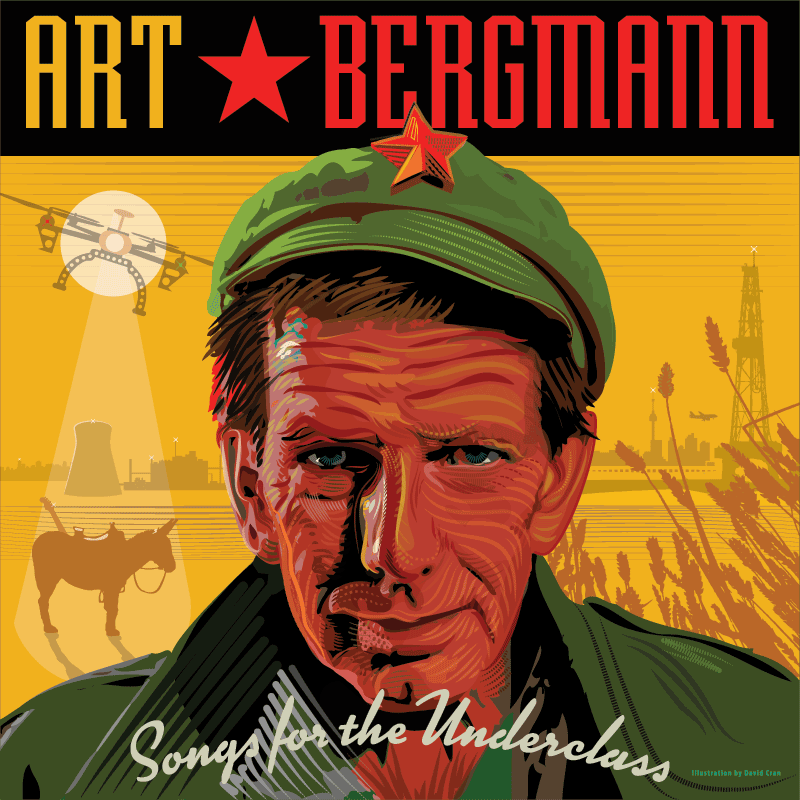 Art Bergmann reveals his mastery of the genre with the 4 song EP Songs for the Underclass. He shows you the screwed-up world and you have to decide how to deal with it. Social commentary is not new for Art. From 1986's Empty House to 1990's Sexual Roulette to half the songs on his 1991 eponymous album, Art has never shied away from sharing his thoughts on poverty, militarism, globalization, or politics. There is a straight line from those songs to these Songs. But don't think this is a case of a tired-old-never-was trying for a comeback. Art's uncompromising attitude - which caused much grief for record companies - is rampant in these tunes. Songs for the Underclass is the product of a master craftsman who has spent decades honing his skills. Songs for the Underclass is the best new music to come along in ages. It's the emergency lights in the stagnant sewer of the recording industry. Every one of these 4 songs is carefully built and polished to perfection. They showcase Art's gift for turning out phrases that speak volumes. The music fits like a custom jacket. The combination guarantees these songs will take root in your mind. It's impossible to over-emphasize the quality of this work: these are top-notch, killer tunes - the best set of new songs this century. But Songs isn't just master songcrafting. These are proper protest-songs. It is impossible to listen and not have your mind kicked open. 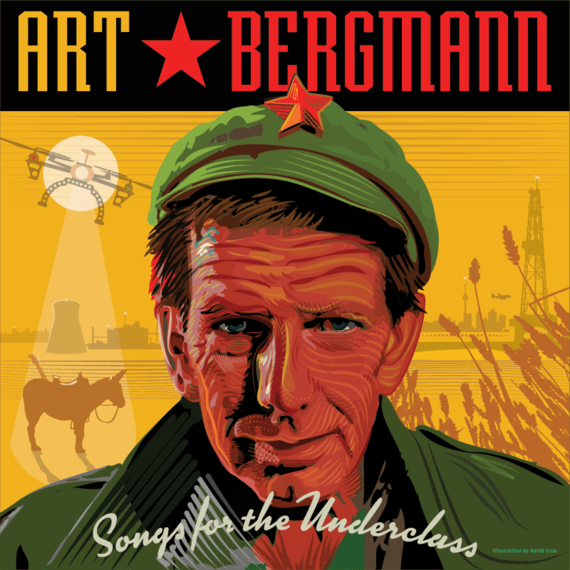 Art Bergmann fans have been fretting for 2 decades, hoping desperately that Art would, someday, maybe, write another tune. Songs for the Underclass was worth that wait. And there's even better news. There's going to be an album soon, too. Songs for the Underclass was released on the 26th on (weewerk) records for digital download through iTunes. It comes out on CD and Vinyl on September 5th or you can preview via livestream. Art is also touring, check his site. The slow-drone of this song adds a third meaning to 'drone'. The first drone is the US Unmanned Ariel Vehicle which bombed a wedding in Yemen. The second drone is the sleeper terrorist waiting for his suicide attack. The third is laid over heart-thumping drums; an ominous combination of distorted guitar and fuzzy bass. It's a drone that moves though, hypnotizes and drags you to the unavoidable conclusion. Drones of Democracy is a pointed attack on the irony of bombing for peace. Musically, it's a slow, driving beat with howling guitars, leading to a crescendo of wailing instruments. Art and producer Chris Wardman have created a soundscape perfectly suited to the lyrics. It is arranged so that the final build leaves you feeling like you are standing in the aftermath of a bombing. There is no explosion of sound - There's a slight muffling as if you just lost your hearing because of a bomb. The bass continues its ominous flight. Gently wailing guitar echoes grief. The synth and other instruments fill out the scene. This is a masterpiece of sound mixing which puts you at ground zero. This is rousing electric-folk two-step which makes for an instant sing-along. Art fires surgical strikes on globalization and capitalism, but beware! You won't get to ride the bandwagon. Fans know that Art is always generous with the blame and standing with him doesn't make you safe. Art's ability to jam-pack meaning into a phrase really comes out in Company Store. Every verse is a whole novel in a few lines, and may send you researching issues. There's no law that awareness had to be sombre; Company Store will have you jumping around and shouting the chorus. It's a great rockin' tune with a dagger to the brain. Crooked Man hits home like nothing I've heard this century. It's melodic despair and desperation driving headlong towards violent revolution. Every word in this song is carefully chosen and Art's vocals drive them home like a nailgun. Art's acoustic guitar lays down a classic protest-song foundation with a generous dose of folk. Joe McCaffery's psychedelic electric adds the depth while Tim Deacon's mandolin flies on top like a flock of starlings. The rhythm section is as tight as a banker's wallet. And when the revolution comes, the assault will have you cheering. This is truly a masterwork. How many will be sacrificed? To your cold appraising eye? Greed is a serial killer but Art knows where the bodies are. This song would be right at home on stage in New Orleans... especially in a still-mortgaged, Katrina-condemned lounge. This is a murder ballad, complete with slow drums and fantastic keyboard work by Lorrie Matheson. Emily Burrows' vocal solo near the end will echo in your brain for ages.